31.08.2017 (Hvino News). Today the results of the Japan Wine Challenge 2017 (JWC) competition became known. This year 8 Georgian wines won the highest awards in Japan. The top platinum medal and Regional Trophy went to Saperavi 2015 by Chigogidze Wines. The Vaziani Company won two gold medals and a Regional Trophy. Natia Metreveli, CEO of Vaziani Company, commented to Hvino News: "This day is very special for our company. Vaziani Company wine from Makashvili Wine Cellar - Khikhvi (2016 Vintage) was awarded with Regional Wine Trophy (best Georgian white wine) and with the Gold Medal. Gold medal was also awarded to another qvevri wine - Mtsvane (2016 Vintage). As far as I know this is the first time when Georgian wine Khikhvi gets the highest award in international wine contests. It's very important that old and rare Georgian grape varieties are becoming more and more popular." "I would like to kindly congratulate our colleagues from Chigogidze Wines with winning the highest award. 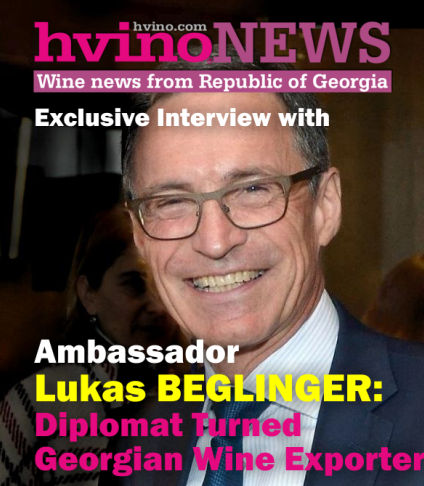 We know that feeling how proud they would be and we wish more success to other Georgian companies in favor of Georgian wine development, " - added Vaziani's Natia Metreveli interviewed by Hvino News. 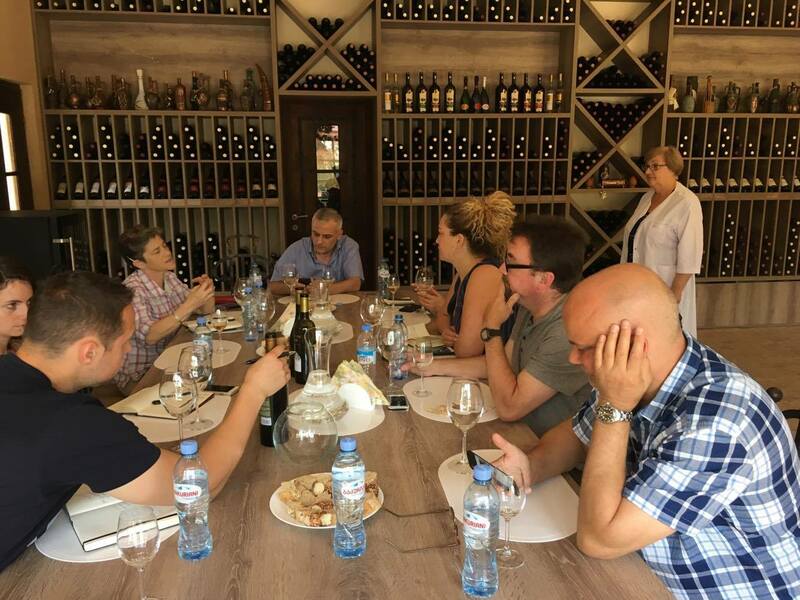 30.08.2017 (Hvino News) A group of sommeliers and wine importers from the United States are visiting Georgia. The guests will visit 18 local wine-producing companies. The group of seven wine professionals from the US is led by Lisa Granik, Master of Wine. Previously, Lisa Granik organized several visits of American wine experts, as well as Georgian wine tasting events across the USA. As Granik said the quality of Georgian wine has been improving year after year. The US is one of the growing export markets for Georgian wines. During the first seven months of 2017, Georgia exported 236,000 bottles of wine to the US, which was 89 percent more compared to the same period of 2016. 28.08.2017. On September 1-3, the fourth International Symposium of Qvevri Wine will be held at the Ikalto Qvevri School-Academy, organized by the Georgian Wine Association. The National Wine Agency (NWA) reports that the aim of the event is to familiarize Georgian society and foreign specialists with the unique qvevri winemaking methodology, its history and culture, and also to provide guests with information about Georgian wines, grape varieties and Georgian cuisine. 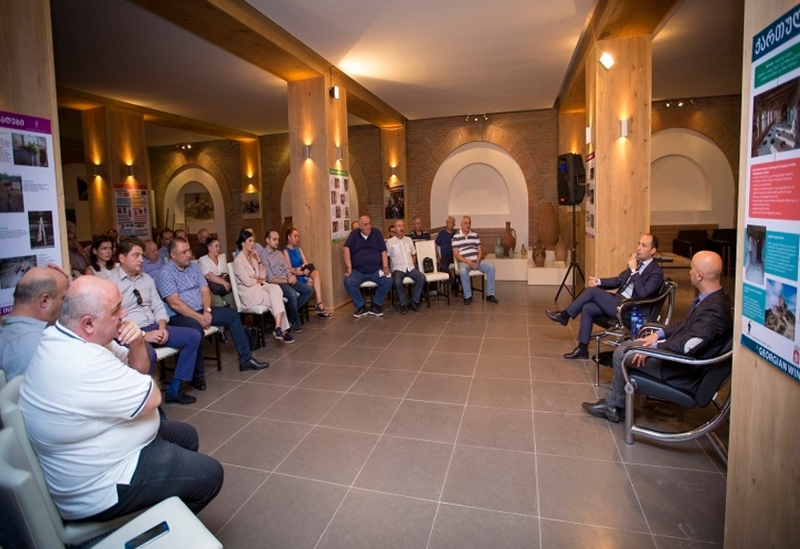 The first international tournament of qvevri wine will be held this year within the framework of the Symposium with both Georgian and foreign winemakers participating. The winner of the competition will be announced on September 3 at the closing ceremony of the event. Scientists, wine experts, sommeliers and journalists from various countries are expected to attend. 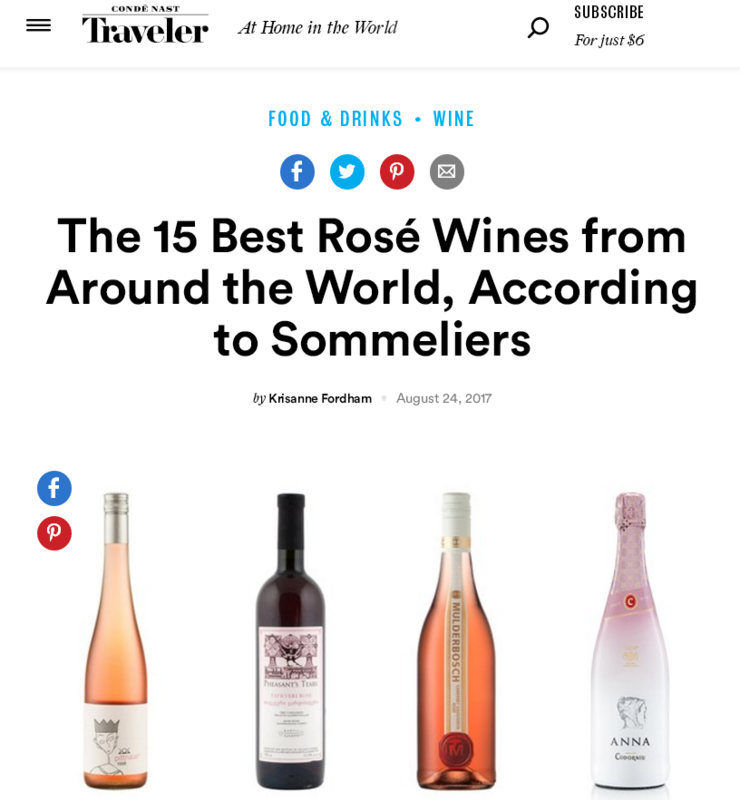 Georgian wine listed among world's best rosé wines by "Condé Nast Traveler"
25.08.2017 (Hvino News). A Georgian rosé wine was recently listed in Condé Nast Traveler's list of "The 15 Best Rosé Wines from Around the World". Condé Nast Traveler is American luxury travel magazine. "The 15 Best Rosé Wines from Around the World" is a list compiled by Condé Nast Traveler's author Krisanne Fordham, published on August 24. The magazine article reads: "In the past year alone, rosé sales have more than doubled, raking in a whopping $258 million in sales, which, according to wine experts, can be attributed to rosé’s rising popularity amongst millennials and its growing cachet. And while French rosé is still the most popular, nowadays, some of the best rosé wines are made outside of France. With the help of some wine experts, we’ve rounded up 15 amazing rosés around the world." 21.08.2017 (Hvino News). Georgian wine is the rising star of China’s wine market, with exports increasing 100% or more annually since 2008. 2017 Georgian Wine Festival features exclusive sessions for wine industry professionals and the media, and also wine lovers. 5-course Singapore Cuisine pairing with 10 premium Georgian wines. Food elements to highlight the pairing friendliness of Georgian wine, and the diversity of wine styles. A full spectrum of wine styles, including: sparkling to still, semi-sweet to dry, traditional qvervi to modern, whites to reds. The authentic Georgian wine styles & indigenous grapes would be introduced. 2 Masters of Wine, Honorary Consul of Georgia, sommeliers and leaders from local wine firms. Answering a question of American wine blogger, SapPrize project manager Inge Olsson explained the reason why SapPrize is open to foreign winemakers only: “The small country of Georgia has over 300 wineries, and nearly all of them use Saperavi. Since our contest entry is free, we could have got hundreds of samples from Georgian producers, so few foreign entries would be outnumbered". "Their chances of winning would be very low, and we were worried that next year the foreign winemakers would lose interest in participation, and contest would become just another national one, not international as intended. 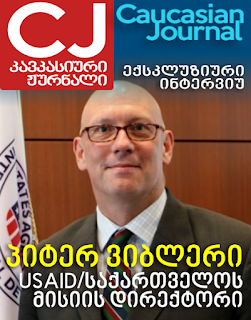 SapPrize's aim is to help the international growers of Saperavi, and to develop their communication with Georgia, not to position Georgia as a rival”, - noted Inge. Read more here. “Now that you explained the logic it makes perfect sense. I agree keeping the international competition entirely international is the correct decision for all involved”, - commented the blog’s author from Pennsylvania, USA. 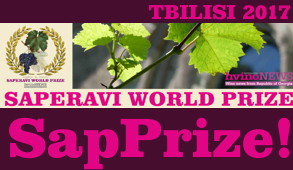 Saperavi World Prize has received official letters of support from two Georgian Embassies: Embassy to Australia in Canberra, and Embassy to USA in Washington. "It is a great advertisement strategy. 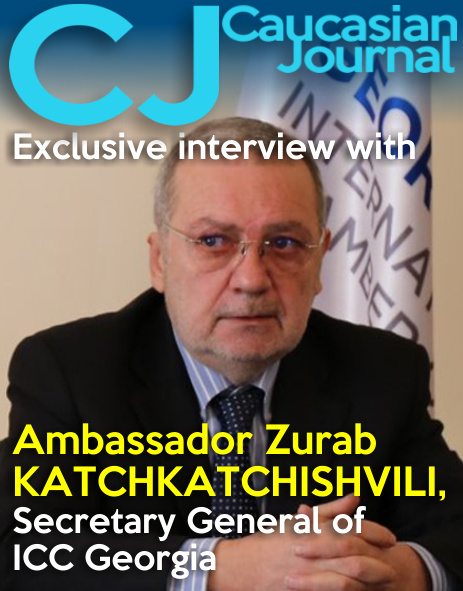 We are fully supporting this initiative and willing to provide any assistance, if necessary" - pointed out the Georgian diplomatic representatives in connection with Saperavi World Prize. Finally, SapPrize is happy to welcome three news contestants from USA, who joined last week: Château Niagara, Fero Vineyards, and McGregor Vineyard, which is the oldest commercial producer of Saperavi wines in the United States. 18.08.2017. Minister of Agriculture of Georgia Levan Davitashvili and Head of National Wine Agency Giorgi Samanishvili met with the representatives of wine and alcoholic beverage companies regarding the organizational issues of vintage 2017. The Minister noted that both the government and the private sector are perfectly ready to carry out the vintage properly. “We have all the preconditions for successful vintage. Grape harvest is quite large, and at the same time wine export has increased. Vintage-related issues are organized - The Government has approved vintage supportive measures. At today's meeting we talked with companies about the details and procedures that are prescribed by the government's decree. The meeting was very important and productive, we received information from the companies about actual issues related to vintage. We believe that we will be able to successfully and effectively conduct the vintage season with the maximum coordination and organization”- stated Levan Davitashvili. According to Giorgi Samanishvili, Chairman of National Wine Agency, the growing export of wine is one of the prerequisites for successful vintage. 16.08.2017 (Hvino News). 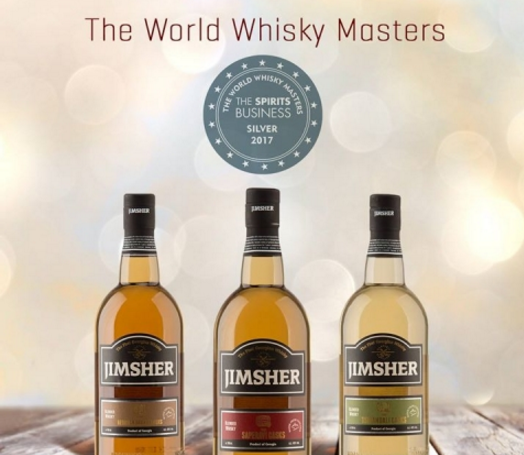 Georgian whisky Jimsher has won silver awards at World Whisky Masters 2017competition in London. "The first round of the competition, Europe – Blended Standard, produced two Silver medalists hailing from Georgia: “easy drinking” Jimsher From Georgian Brandy Casks and “waxy, fruity” Jimsher From Tsinandali Casks. Moving into the Europe – Blended Premium round and Jimsher’s success continued, with Jimsher From Saperavi Casks securing a further Silver for its “gorgeous nose”, - reads the article on The World Whisky Masters 2017 results, published in The Spirits Business by editor Amy Hopkins. The Spirits Business is international spirits magazine and the organizer of World Whisky Masters contest. 11.08.2017 (Hvino News). 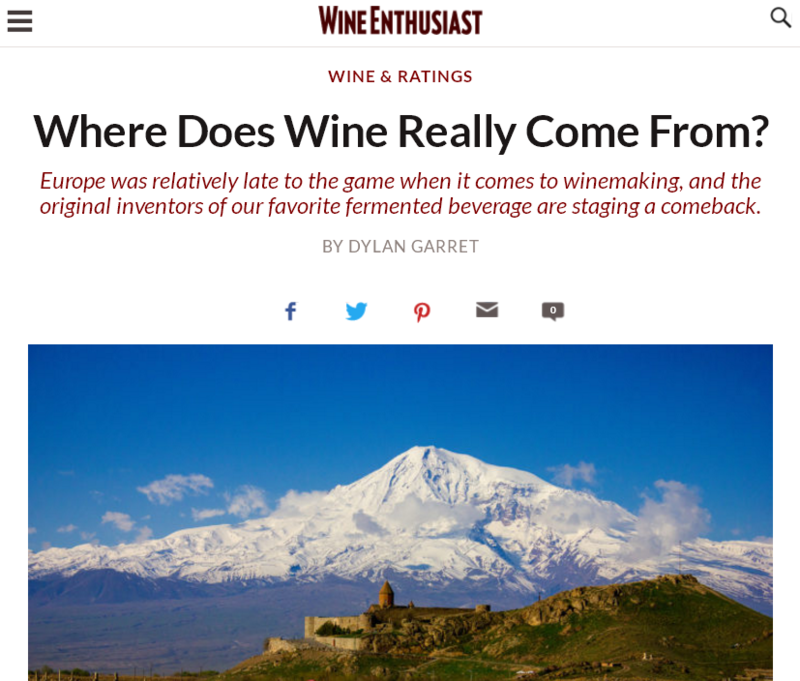 Leading American magazine Wine Enthusiast in a recent article is asking the question: Where Does Wine Really Come From? The author Dylan Garrett says that "Europe was relatively late to the game when it comes to winemaking, and the original inventors of our favorite fermented beverage are staging a comeback". At a recent event hosted by Smithsonian Associates in Washington winemakers and wine historians examined who could in fact claim to be the original creators of wine. "While it’s hard to pinpoint where the first fermented grape beverage was made, researchers traced the origins of domesticated grapes to an area around the headwaters of the Tigris River in Turkey", - reads the article. "Saperavi, for example, is a source of national pride in Georgia. It’s one of the few teinturier grapes—meaning its flesh and skin are both red—used in single-varietal production. It accounts for the vast majority of the nation’s red-wine production, but is rarely seen outside the area other than isolated plantings around New York’s Finger Lakes region. 10.08.2017 (Hvino News). 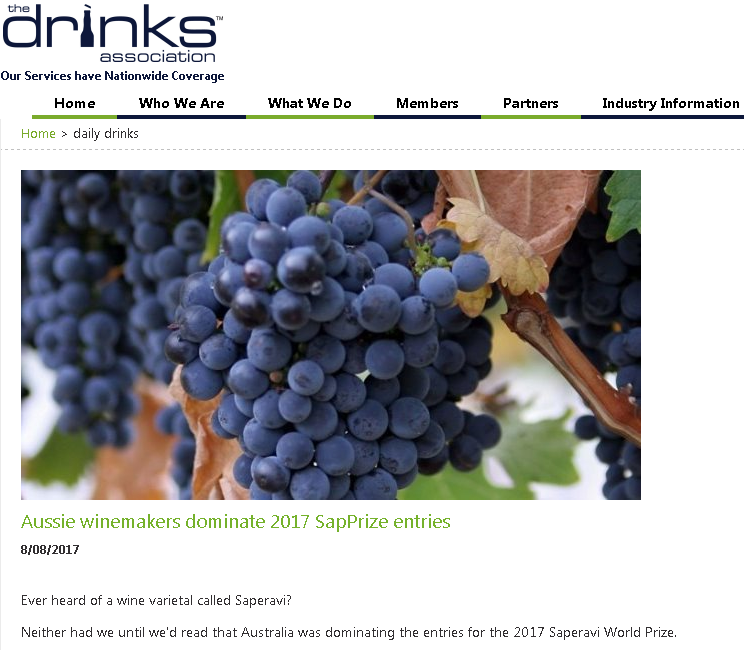 Saperavi World Prize, organized by Hvino News this year for the first time, has recently received significant media coverage in Australia. High media's attention is caused by active participation of Australian winemakers in the contest in Georgia. Ever heard of a wine varietal called Saperavi? Neither had we until we'd read that Australia was dominating the entries for the 2017 Saperavi World Prize. Saperavi is the European nation of Georgia's signature grape. David Williams describes its grapes in The Guardian as producing "deeply coloured wines with a kind of wild, almost untamed intensity of tannin, finger-staining fruit and acidity that has very few peers." Saperavi vines are found in Australia, United States, New Zealand, Central Europe, and former Soviet republics. However, it's a relative unknown in many countries outside Europe. It was only recognised by the US Alcohol and Tobacco Tax and Trade Bureau as a variety in 2014. 08.08.2017. 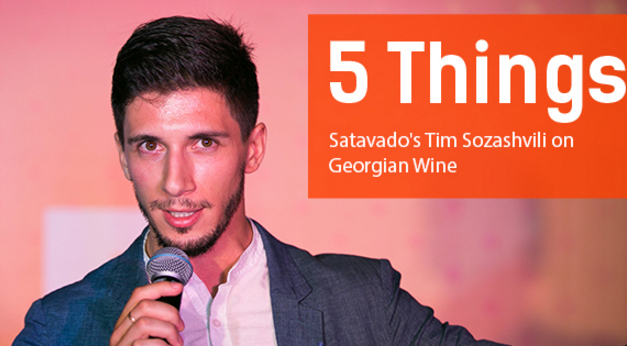 We ask Tim Sozashvili about drinking Georgian wine in China – and yes, that would be Georgia the country. 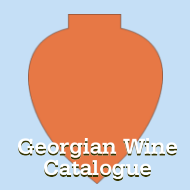 What is your connection to Georgian wine? Every Georgian is somehow connected to wine. My grandfather has a vineyard and he makes wine at home, in Georgia. My uncle’s winery is 102 years old, and it’s been developing over a century to make the best wine possible. I’ve seen it and I grew up with it. What’s so special about Georgian wine? It’s got a whole history behind it – Georgian wine is the oldest wine. Wine originated in the Caucasus, where Georgia is. 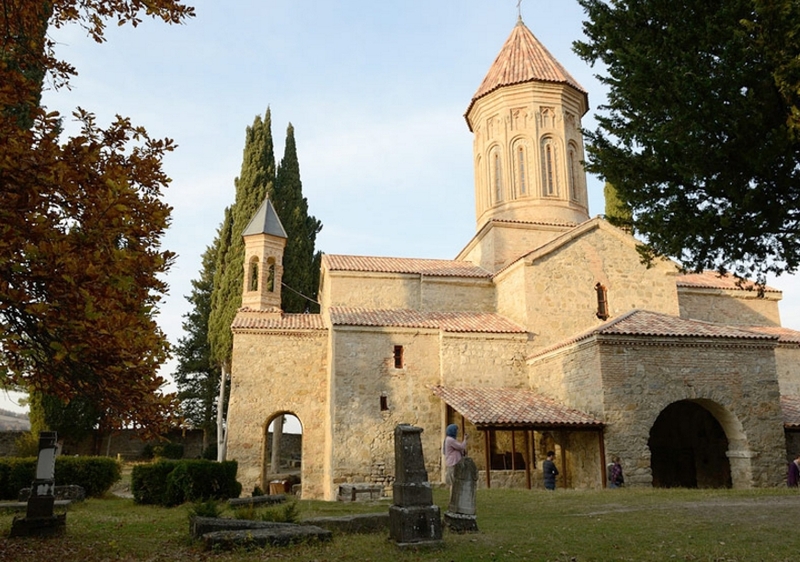 French and Italian wines are famous, but wine culture spread there from the Caucasus – and recently French wine scholars finally admitted that Georgiais the cradle of winemaking. 08.08.2017 (Hvino News). 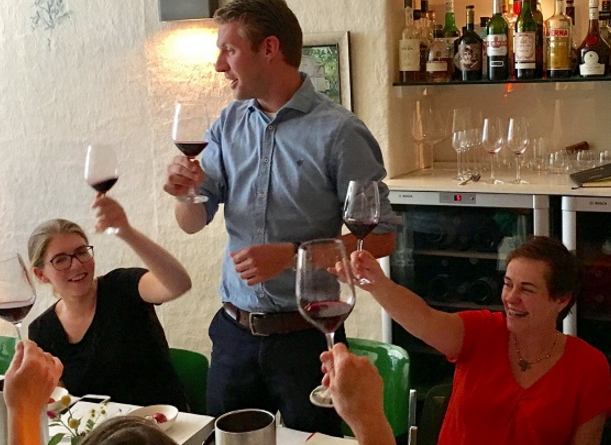 At a Georgian wines tasting held recently in Amsterdam, Dutch sommeliers tried various parings. The winner was Satrapezo Saperavi Qvevri 2014 pairing with wild goose. 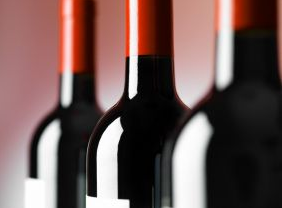 The event was attended by local sommeliers, journalists and wine writers. "Sommeliers from Western Europe have a general interest in our wines but they need to explore our country. As a result of this tasting, Dutch Guild of Sommeliers selected best sommeliers to visit Georgia in September. We are happy to cooperate with the Dutch Guild of Sommeliers which has a serious interest in our wines",- said Irakli Cholobargia of National Wine Agency. In 2017 National Wine Agency signed a contract with Netherlands company "Saperavi Wine Agency", which imports Georgian wine and implements various activities to increase the awareness of Georgian wine in the Netherlands. 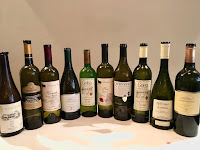 12 wines were represented at the tasting in Amsterdam, by Gotsa Wines, Telavi Wine Cellar, Schuchmann Wines, Bagrationi, Koncho & Co and Tbilvino. The sommeliers descussed how to pair various types of Georgian wines with food. According to Irakli Cholobargia, the Netherlands market has a great perspective for Georgian wine export. 06.08.2017. ​This week Georgia became the first guest wine region at the shiny new Cité de Vin museum in Bordeaux. Georgians have been making wine for 8,000 years. Though debate still swirls over whether that makes them the oldest winemakers, the drink is central to their culture. The national wine agency says that the word “wine” derives from the Georgian “ghvivili”, meaning to smoulder or ferment; the curls and loops of Georgian script are said to mimic vine fronds and grapes. The country has 525 indigenous grape varieties. It still makes wine using the ancient method of fermenting the whole fruit in conical clay jars. Exports of Georgian wine to America are up 43% on last year; those to China are up 104%. 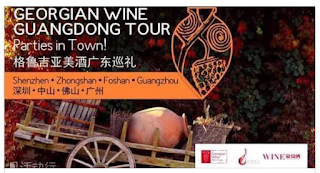 The wine agency recently toured Guangdong province, and recommends a Georgian semi-sweet with some sizzling char siu [Chinese barbecued pork - HN]. It looks as if 2017 might be a very good year. 05.08.2017 (Hvino News). According to official data, in January-July 2017, around 38,3 million bottles of wine were exported from Georgia to 44 countries worldwide. Based on these numbers, exports were 60 percent higher than for same period in 2016. In the period under review, 84.3 million USD worth of wine have been exported, that is 52% higher than the data of the last year. “According to the export data of 7 months 2017, wine export has grown by 60% compared to the same period of the previous year. Wine realization income has grown by 52%. Export has grown in the countries of European Union, South-West Asia, USA and other countries, which is a result of collaborated work and marketing activity of National Wine Agency and wine sector”- stated Giorgi Samanishvili, head of National Wine Agency. Top five export markets are: Russia, China, Ukraine, Poland, and Kazakhstan. Export growth is remarkable to the following countries: China – 80% (4,462,631), Russia- 86% (23,740,750 bottles), Ukraine – 41% (3,653,334), Poland - 20% (1,427,458), Belarus - 42% (814,022) Latvia - 27% (830,852), USA - 89% (236,012), Germany - 34% (234,000), France - 450% (95,530), Israel - 202% (127,334), Azerbaijan - 170% (102,342). 02.08.2017 (Hvino News). 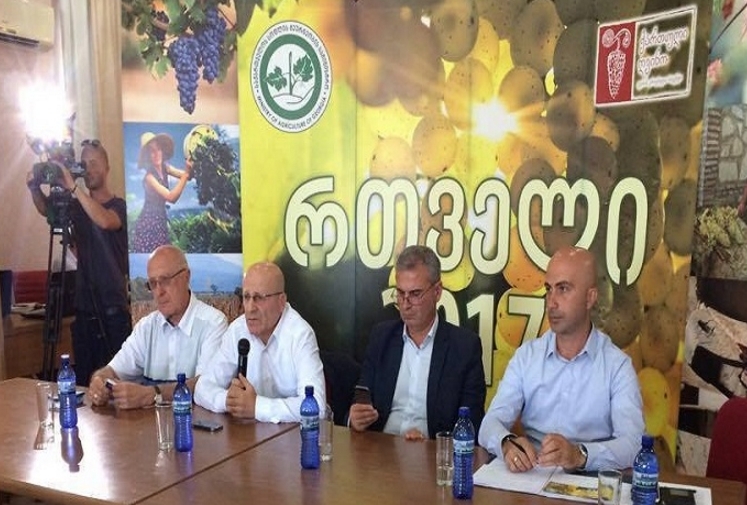 In the framework of the Fourth International Symposium of the Qvevri Wine, the Georgian Wine Association (GWA) will organize the first international contest of qvevri wine in September 2017. 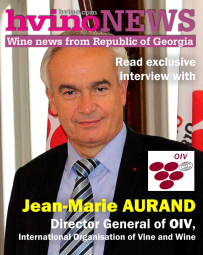 According to GWA, the aim of the competition is to present the best qvevri wines to the world (both Georgian and foreign) and to support qvevri wine production and consumption. At the same time, the contest reflects raising popularity of qvevri wine produced in different countries. The competition is open to qvevri wine producers from all countries and wine regions in the world. However, there are separate nominations for national (Georgian) and for international wines. Samples will be assessed by national and international judges, whose number will depend on the amount of wines entered in the competition. A diploma certifying the reward, will be handed or addressed to the owner of the wine declared on the registration sheet. The details can be found here. Awarded wines (best in the national and international category) will be presented by Master of Wine – Lisa Granik in the Cite du Vin, Bordeaux, during the Qvevri Wine Masterclass on September 17th. 02.08.2017 (Hvino News). Georgian wine was presented in 4 cities of China. In China's southern province of Guangdong, wine professionals and local media representatives were able to taste up to 40 different Georgian premium wines. 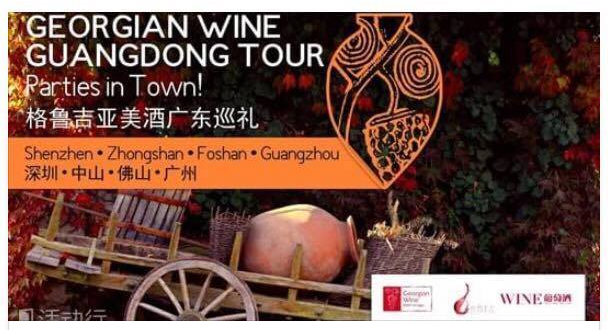 The seminars with tasting were conducted by Debra Meiburg, Master of Wine, in Gvanjou, Chuzunshan, Shenzhen and Foshan. Along with wine professionals, local distributors and importers attended the event. Debra Meiburg, Master of Wine notes that Georgia offers a wide variety of Georgian wine to Chinese consumers and the Chinese consumers will be able to select the desired wine from these varieties. China remains a strategic export market of Georgian wine. According to the data of 6 months of 2017, 3, 84 million bottles are exported, with an annual increase of 104%.